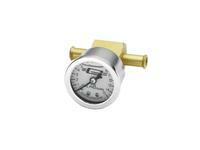 Mr Gasket Liquid Filled Fuel Pressure Gauge is conveniently small 1 1/2" diameter gauge will fit almost anywhere. Liquid filled to resist the most severe vibrations in automotive and off-road usage. The gauge has 1/2lb. increments and a range of 0-15 lbs. 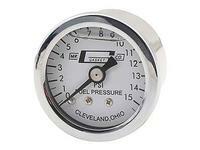 This Mr. Gasket fuel pressure gauge reads in 1/2 lb. increments with a range of 0-15 lbs. This fuel pressure gauge reads in 1/2 lb. increments with a range of 0-15 lbs. and includes 3/8" fuel line adapter.